It’s Saturday, June 3, and the line to get into The Siren stretches way around the block. All these people are waiting to get into the sold-out Dave Alvin and Phil Alvin and The Guilty Ones show. My wife and I—full of artisanal burger deliciousness from the Flavor Factory—are fueled up for a night of fun in Morro Bay’s impressive new music venue. Located at 900 Main St., it used to be called the Fuel Dock, but The Siren owners Paul and Kelly Boisclair have expanded the old club into the building next door to create a 370-capacity music venue, bar, and restaurant, the latter of which will finally come online in about three weeks to serve a limited menu of upscale pub food. 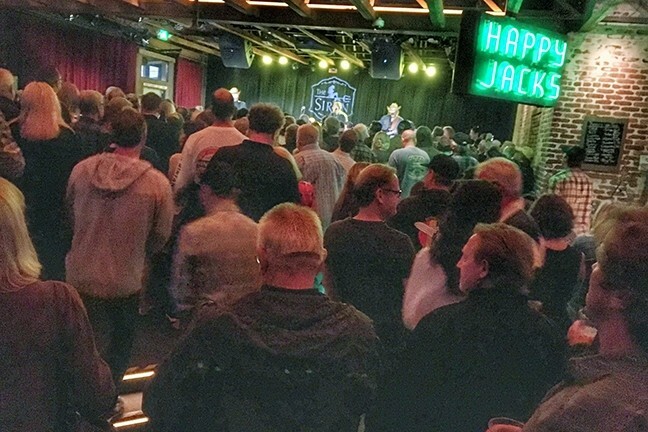 STANDING ROOM ONLY: Morro Bay’s The Siren was packed to the gills on June 3, for Dave and Phil Alvin and The Guilty Ones. I remember when the location used to house Happy Jacks, which we affectionately called Stabby Jacks because of its mostly undeserved reputation for attracting dangerous knife-wielding fishermen. Tonight, The Siren is filled with mostly 30-something-to-middle-aged music lovers. The line out front is long but it moves quickly, and soon Anna and I are inside waiting to get some drinks. The place looks great! Exposed ceiling trusses and exposed brick walls, some TVs scattered around, cool art like a blown-up image of the Led Zeppelin IV album cover and a 36-star American flag from 1865. The place has a great vibe though it’s not quite finished inside—the liquor is on temporary shelving as the back bar gets constructed. There’s also a really charming outdoor patio with a fire pit in the center. If everyone was spread out, 370 people would comfortably fit inside and on the patio, but people are here for a concert and most folks are concentrated around the stage. We’re chilling on the patio with about 20 people when the Alvins and their band come in through the side gate to head to the green room, and everyone starts clapping as Dave and Phil smile and wave to us. This turns out to be as close as I’ll get to the Alvins tonight. The show, in partnership with Good Medicine Presents, is wisely capped at 300 tickets, and when the Alvins take the stage, it seems like at least 200 of the 300 present are packed around the stage, which due to the floor plan’s L-shape is only viewable from one side of the club. GO MAD! 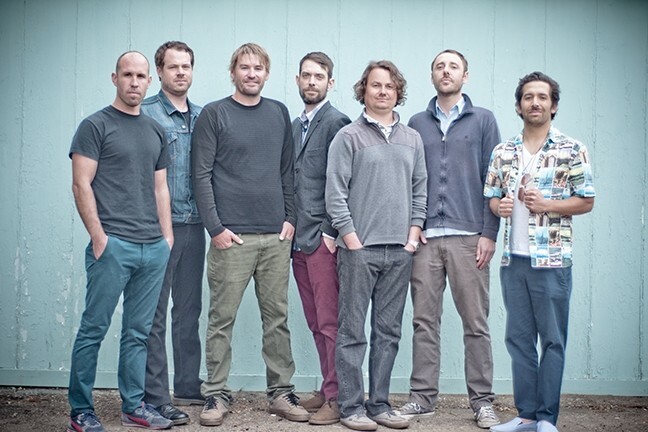 : The Mad Caddies play the next Siren and Good Medicine Presents collaboration on June 20. On top of that, because the foundation of the building next door was about 20 inches higher, the Boisclairs’ only design option was to build a riser in front of the stage that meets the foundation next door. The riser area in front of the stage can comfortably hold about 70 people though there’s a lot more on it now. We’re not on the riser, and all we can see are the heads of the performers—little dots in the distance above the throngs of people in front of us. “It’s already in the works,” Monte tells us. In fact, Monte and the Boisclairs have big plans for the place and hope to attract a mix of good local performers along with bigger name touring acts. For most shows that probably won’t attract standing-room-only crowds like this one has, the stage configuration will be fine. When you’re in the L-end away from the stage, it’s easy to have a conversation going despite the music, and the layout makes getting a drink easy, too. 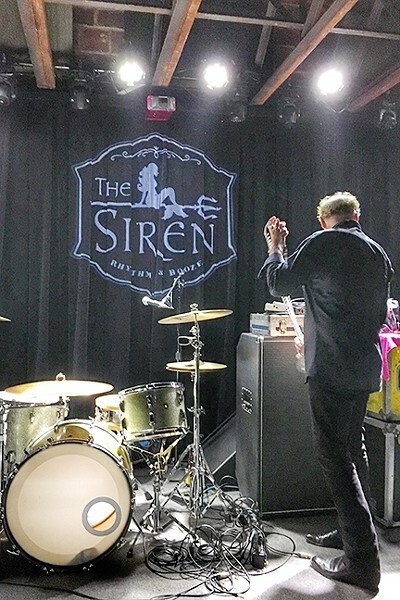 AFTER THE SHOW: The Siren’s motto, Rhythm & Booze, hints at the club’s focus on good music and good times. This week The Siren hosts the alt-rock of Ghost Monster on Friday, June 9 (9 to 11:30 p.m.); pop, funk, rock, and reggae originals and covers by Bobby Love and Sugar Sweet on Saturday, June 10 (3 to 6 p.m.) and the high energy dance music of Back Bay Betty later that night (8:30 to 11:30 p.m.); and finally The Siren Jazz Jam led by Tracy Morgan on Sunday, June 11 (4 to 7 p.m.). The next Siren show partnered with Good Medicine Presents is Fat Wreck Chords recording artists The Mad Caddies on Tuesday, June 20 (8 p.m.; 21-and-older; $15 presale at ticketfly.com or Boo Boo Records). The horn-driven ska and punk act also makes forays into everything from country to Dixieland jazz. That’s exactly the kind of passion for live music that’s going to make The Siren one of the best nightclubs on the Central Coast.